Cantaloupe is also known as musk melon, sweet melon and so on and is a summer fruit rich in minerals, vitamins, antioxidants and other nutrients. So it is very beneficial for your health as well as for your hair and the skin. Cantaloupes contain folic acid in abundance, which is essential for the regeneration of the cells and making your skin healthy. It helps in reducing wrinkles, providing elasticity to the skin and in the formation of collagen. So it is an excellent anti-ageing agent. The presence of vitamins K and E helps in keeping your skin healthy and glowing. It also hydrates your skin because of its high water content. It also contains vitamin B, choline and betaine, which are very effective in keeping your skin rejuvenated. Cantaloupes, being rich source of vitamins A and C are very effective for your skin and help in skin regeneration as well as in the formation of collagen. Collagen makes your skin look young and glowing. The juice of cantaloupe may be used for treating eczema and for the removal of freckles. It is also applied on burns and cuts. Cantaloupes are rich in insonitol, which is a vitamin from the vitamin B family. This is good for preventing hair loss and to increase the growth of the hair. You can use cantaloupes for conditioning your hair in summer months. Just mash them and massage your hair with it. Wait for a 10 minutes and then wash off with shampoo. Due to smoking and exposure to smoking for a long period of time, vitamin A is lost from the body. Cantaloupes provide you the vitamin A that is lost from the body and helps in rejuvenating the lungs. So it is very useful for those who smoke. 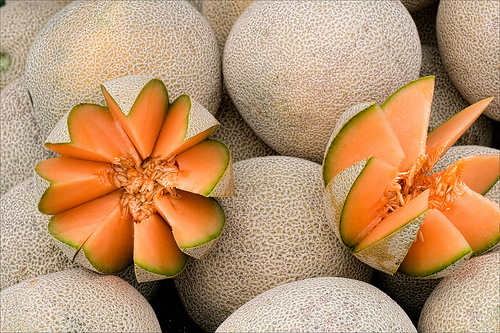 The folates contained in cantaloupes help in the production of new cells and in maintaining them. So it is beneficial for pregnant women. The skin of cantaloupe helps in curing tooth aches. Take about 6 gm of the skin and simmer it in water till it is cooked. Cool it and use it to rinse your mouth. Being rich in potassium, cantaloupes help in controlling blood pressure and hence keep your heart healthy. Potassium is also effective in preventing hypertension and protects the body from the harmful effects of sodium. The compound adenosine found in cantaloupe has the properly to make blood thin and is therefore good for the heart and prevents blood clotting. Vitamin C also prevents the hardening of arteries and the folates prevent heart attacks. The potassium present in cantaloupe helps in making the heart beat normal and in increasing the availability of oxygen to the brain. This makes you feel more relaxed and increases your concentration. It also contains superoxide dismutase, which helps in lowering the blood pressure and making the nerves relaxed. It also helps in preventing cellular death as a result of oxidative stress. Cantaloupe contains beta carotenes, which when absorbed by the body changes in to vitamin A. This is very beneficial in improving your eye sight. It also helps in protecting your eyes from cataract. According to studies made, it is proved that if you consume vitamin enriched food regularly, it can reduce the chances of cataracts by 40%. Cantaloupe is rich in fiber and low in calories and therefore you can consume it when you are on a diet to lose weight. The fibers present in it make your stomach full and prevent you from eating more food. It also prevents you from eating snacks in between meals as it occupies more space in your stomach and make you feel full. You can get rid of intestinal worms by eating crushed seeds of cantaloupe. These seeds are also helpful for those suffering from cough, cold indigestion and fever. You can make cantaloupe tea by taking the root of cantaloupe. It has great medicinal values. Free radicals formed in the body can attack the cells of the body and cause cancer. Vitamin C and beta-carotene present in cantaloupe fight against these free radicals and destroy them. The extract that you get from cantaloupe called oxykine, can prevent diabetic nephropathy, which is a condition wherein the kidney cells are highly damaged. Cantaloupes also contain simple sugars and are therefore not harmful for diabetic patients. If you want to quit smoking, start consuming cantaloupes as the minerals contained in them help you to overcome the nicotine withdrawal symptoms associated with it. It also provides you the vitamin A that you have lost as a result of smoking and helps in fast recovery. Cantaloupe is a rich source of Vitamin C, which is essential for enhancing immunity of the body by activating the white blood cells. White blood cells fight against the foreign bodies that enter the body and also destroy the infections that are caused. Vitamin C is also a strong antioxidant and reverses the harmful actions of the free radicals in the body, thus preventing any damage to the skin which may cause premature ageing. So include cantaloupe in your daily diet and stay young for a longer period of time. Cantaloupe has the property to relax your nerves and calm anxiety. So it is beneficial for those who suffer from insomnia and provide them restful sleep. Cantaloupes contain vitamin C, which helps in regulating the menstrual flow, reduces pains caused as a result of it and also removes all other menstrual problems. Some consume it to induce menstruation. Bitter Gourd Juice for Weight Loss: How Does it Work? the info on the benefits of Canaloupe was very knowledgable, thanks.